Amazon has long been rumored to be planning to launch Kindle Stores in China and Japan (this rumor is 2 years old) but until today I had very little proof that these supposed plans were real. I've just been reading the user manual for Amazon newest ereader. We're still a few days away from the first Kindle Paperwhite getting into the hands of consumers, but Amazon has already posted the user manual for this ereader. And as per my usual habit, I made time this week to read it in the hopes that it would explain technical questions which haven't been answered yet. I still haven't finished reading it, but I have already come across a couple interesting details in the back of the manual. There was a set of addresses buried back in the warranty info. Amazon wanted to make it clear exactly where you could send broken devices. There were addresses for the US, Canada, Europe, India, and, for Kindle owners who bought from Amazon.cn or Amazon.co.jp, 2 more addresses for China and Japan. 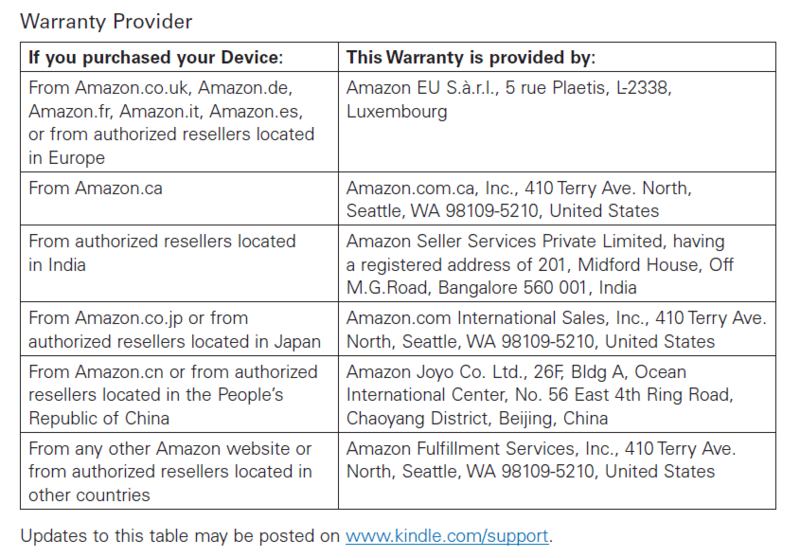 Yes, Amazon wants to make sure that customers of their Japanese and Chinese websites can return the Kindle. Here's the fun part: Neither of those websites sell the Kindle. I did check, and while I found all sorts of accessories for the Kindle I did not find a single Kindle ereader. If there was ever any doubt that Amazon planned a Kindle Store in either of those countries, I would say that it has been removed. Amazon clearly plans to sell the Kindle Paperwhite in both those countries. And in case you were wondering, that is something they hadn't planned to do with the Kindle Touch - at least, not when the user manual was written. P.S. Did you notice there was no address for Brazil? While that does not disprove a Kindle Store in that country, it does suggest where Amazon has their priorities. Asia comes first. Does that means India will see paperwhite soon.